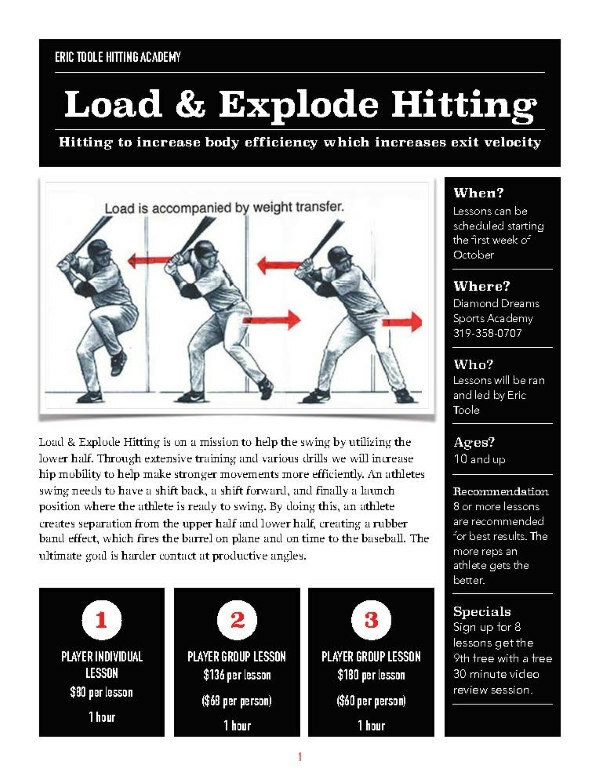 Load & Explode Hitting is on a mission to help the swing by utilizing the lower half. Through extensive training and various drills we will increase hip mobility to help make stronger movements more efficiently. An athletes swing needs to have a shift back, a shift forward, and finally a launch position where the athlete is ready to swing. By doing this, an athlete creates separation from the upper half and lower half, creating a rubber band effect, which fires the barrel on plane and on time to the baseball. The ultimate goal is harder contact at productive angles. Lessons will be ran and led by Eric Toole. 8 or more lessons are recommended for best results. The more reps an athlete gets the better. Sign up for 8 lessons get the 9th free with a free 30 minute video review session.